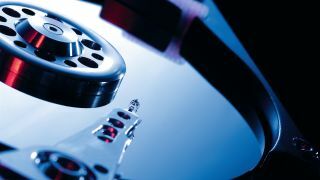 Toshiba has unveiled a 5TB enterprise hard drive, touting it as the largest capacity of its class without helium gas. The 3.5-inch MG04 Series drive uses five 1TB platter magnetic disks. It boasts speeds of 205MiB/s, 24 per cent faster than existing Toshiba models. There are two versions, SAS and SATA, with four models per series. Both feature interface speeds of 6Gb/s. The MG04 Series is designed for use in mid-tier servers, cloud networks, and capacity-optimised data centres. The hard drive comes with additional security, thanks to a Sanitise Devise feature, which lets businesses quickly invalidate sensitive data on the magnetic disks. An optional persistent write cache technology helps prevent data loss after a sudden power outage. Toshiba also offers 2TB, 3TB and 4TB models. The drives will launch later this month. Pricing was not disclosed.